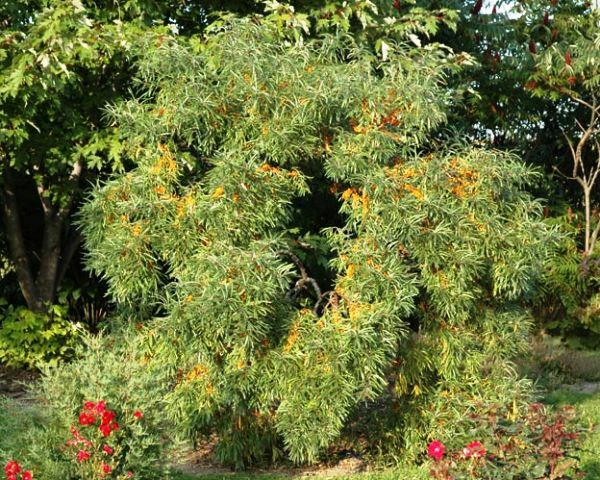 Sea buckthorn is a plant of extreme temperate region. It is found throughout Europe, including Britain, from Norway south and east to Spain. It also grows in China, Himalayan regions of India and Pakistan and in Northern Japan. It is also grown commercially in many countries. China is the largest grower of this fruit in the world. A thorny deciduous shrub 0.5 to 3.0 m tall. 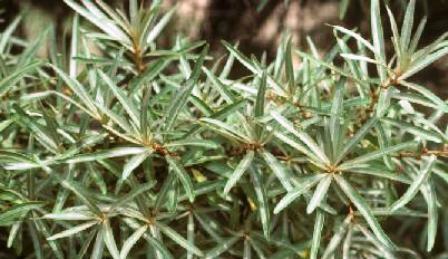 Leaves linear, 1-5 cm long, greenish-grey above and silvery-grey to rusty-brown underneath. 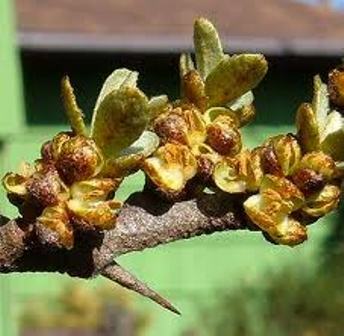 Flowers small, approximately 3 mm in diameter and yellowish-green; male and female flowers are borne on separate plants. Fruit elongated, yellow or yellowish-orange juicy drupe, 8–10 mm long. The fruits of sea buckthorn are a rich source of vitamin C and E, fibre and essential fatty acids. The amount of vitamin C contained in 50 grams of sea buckthorn berries is equivalent to a medium-sized orange. Sea buckthorn fruits are widely used in food industry to make juices and jams. The berries are also dried to make a powder. The pulp has an attractive yellow colour. So its use is being considered in Sweden as a substitute for synthetic colors used in various food products. The fruits of sea buckthorn contain 4-7 % oil, which is used in the preparation of dietary supplements and cosmetics. 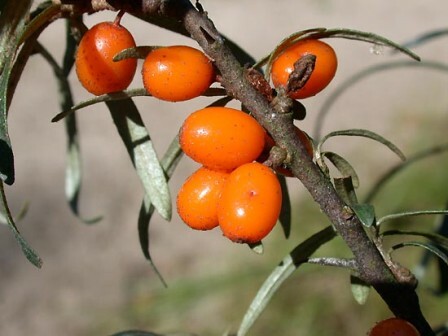 Plants of sea buckthorn are quite hardy and therefore can even grow on very poor soils. It, however, will not grow shade and therefore should be planted in sunny areas. The plants are mostly raised from seed. There are some clonal selections too, which are multiplied by cuttings. Plants are planted 1 to 1.5 metres apart in rows which are kept at 3 to 6 m from each other.